Rothay Garth Guest AccommodationRothay Garth has a superb position combining glorious mountain views with easy access to Windermere Lake and Ambleside. Ambleside village is one of the best known and visited due to its ideal location, a perfect base at the Heart of the Lake District. Rothay Garth at Ambleside is a beautiful traditional Victorian Lakeland slate building set in its own landscaped grounds. 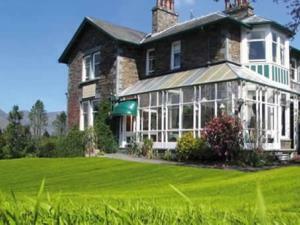 Whilst retaining its character and many original features, Rothay Garth offers en suite rooms all with tea and coffee making facilities, colour TV and radio and hairdryer, a comfortable spacious residents lounge, conservatory looking out to superb mountain scenery, elegant breakfast room and a large private car park. There is also free Wi-Fi available in the lunge area.